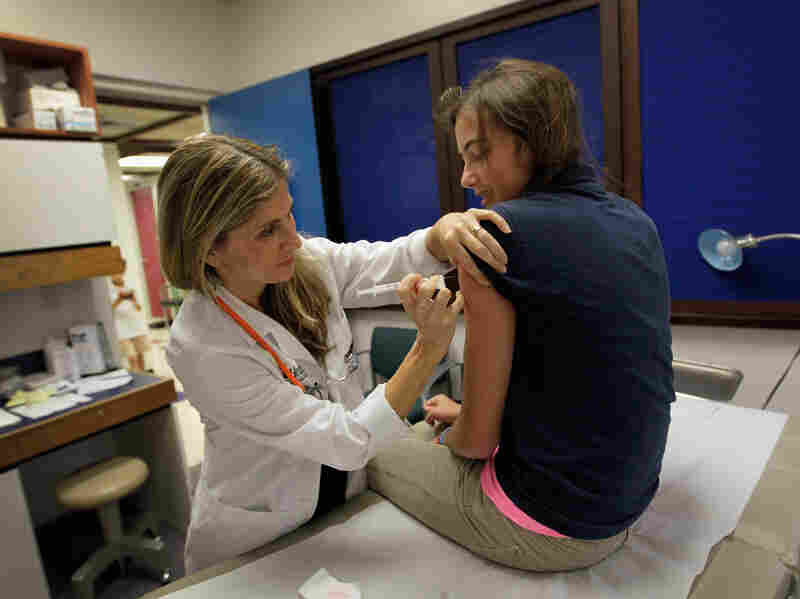 Cervical Cancer Vaccine Also Helps Prevent Genital Warts : Shots - Health News The vaccine against human papillomavirus is recommended for girls and young women to prevent cervical cancer. A study finds it also protects against genital warts, a common sexually transmitted disease, even if people get less than the recommended three shots. The HPV vaccine was created to protect women against the virus that causes cervical cancer. But it also helps prevent genital warts, a common sexually transmitted disease caused by the same virus, a study finds. Girls and women who got two doses of the HPV vaccine got almost as much protection from genital warts as people who got the recommended three doses, according to a study published Tuesday in JAMA, the journal of the American Medical Association. This study looked at the health records of more than 1 million girls and women ages 10 to 24, using Sweden's national health registry. The researchers could see when participants had had HPV shots, and when they were diagnosed with genital warts. The girls and women who got just two doses of vaccine had 59 more cases of genital warts per 100,000 person-years compared to those who had three doses. That's a pretty small difference overall. "I believe we have more questions to answer before we know if two or three doses offer the best protection," says Lisen Arnheim Dahlstrom, an associate professor at the Karolinska Institutet in Stockholm, who led the study. Those questions include whether girls who start the shots when they're 11 or 12, as recommended, would get better protection against the human papillomavirus, and whether that protection wanes over time. "Therefore, clinicians and patients should stick to the recommended dose schedule until other recommendations are made," Arhneim Dahlstrom tells Shots. The results echo those of smaller studies looking not at genital warts but infection with the HPV virus. They also found that fewer than three shots still offered some protection. If this turns out to be true it will be good news, because doctors have found it hard to get teenagers and young women to complete the recommended vaccinations. Just one-third of girls ages 14 to 19 have gotten all three doses, the CDC reported in 2013. About half have had a single dose. Cost and inconvenience are big issues, as well as parents' concerns about safety and potential effects on sexual activity. There are two vaccines on the market for HPV. One, called Gardasil, protects against HPV types 6 and 11, which cause 90 percent of genital warts. The warts, also called condyloma, aren't dangerous, but they can be uncomfortable. "Having genital warts at a sensitive age can be very stressful," Arnheim Dahlstrom says. Though many people are able to clear the infection themselves without treatment, others have recurrent infections even if treated.